Stuffed spleen is a real treat for offal lovers. In Morocco, where the dish is associated with specific times and places, it has nostalgic value to those who enjoy it. It’s sometimes prepared during Eid Al Adha, when spleen is on hand after a home slaughter, and year-round stuffed spleen can be purchased from some butcher shops or grill-style restaurants. The stuffed beef spleen (tihane) in this photo has a filling of kefta (ground beef or lamb), rice, olives and hard-boiled eggs. The filling was heartily seasoned with Moroccan spices and herbs and once stuffed, the spleen was oven-roasted. It can be prepared ahead of time, sliced into single servings, and then frozen until needed. I’d never made stuffed spleen before, so I asked Moroccan food writer Nada Kiffa of Fleur d’Oranger, Masala and Co. for guidance. She and her mother were kind enough not only to share their family recipe for stuffed spleen, but also to demonstrate the steps involved so that I could photograph the making of this very traditional dish. Keep reading to see how it’s done. The first step is to make the filling. Here, Nada’s mother has hand-kneaded a mixture of raw ground beef, cooked rice, chopped olives, abundant parsley and cilantro, grated onion, some suet (chehma), lots of garlic, and generous amounts of seasoning which includes harissa and chopped preserved lemon. A few raw eggs are added for binding the mixture. You can vary the recipe a bit by by replacing some of the ground beef with lamb or finely chopped liver or heart, or increasing the ratio of rice to kefta. We made the filling just prior to using it, but it can certainly be mixed ahead of time and refrigerated until needed. This is what raw beef spleen looks like. Although the membrane might be removed for some recipes, Nada’s mother will trim only the fat. That’s because the membrane is needed for holding the spleen intact once stuffed. Note how large the spleen is; the serving tray helps give perspective. Beef spleens average in weight from 1 to 3 pounds (approximately 1/2 to 1 1/2 kg). Wash and pat dry the spleen. Then, at one end of the spleen along its side, make an incision which is large enough to accommodate your hand. Here you can see that the flesh of the spleen is quite fragile. That will become even more evident in the next step. This can be a messy task, so you’ll probably want to wear a disposable cooking glove. If you don’t have one, you can improvise by securing a clean plastic bag over your hand. Gently insert your hand into the incision and bit by bit, work your hand in further and further to create a central cavity which extends the length of the spleen. The flesh is soft and will separate easily, but you’ll need to work carefully so that you don’t tear through the membrane. You also want to do your best to create a cavity which is as evenly centered as possible. Now that you’ve made a pocket in the spleen, you can begin adding the filling. Bit by bit, stuff the prepared mixture into the cavity. You can push it in with your hands, and at times you may want to squeeze the spleen to manipulate and guide the filling toward the end. Nada’s mother managed to get all of the filling into the spleen; it was packed quite full and I was quite impressed! As an extra touch, hard-boiled eggs were pressed into the middle of the filling. Nada’s mother used just 3 eggs; you could stuff in more if you like. Just be sure to space them as evenly as possible along the length of the spleen. Now that the spleen is stuffed, use a needle and thread to make large basting stitches along the incision. At this point you don’t need to be very precise; you just want to close the opening so that the filling stays inside. With the filling held inside by the basting stitches, you can now mold and manipulate the filling to give the spleen a rounded sausage shape. As you do this, try to make sure that the filling is distributed as evenly as possible throughout. Now you’ll want to go back and sew the spleen shut a second time. If you can, mold or press the filling away from the seam so that you have more room along the incision to work. This time around, use smaller stitches which are spaced closer together; you don’t want the spleen to open while it’s roasting! Here’s the finished stuffed spleen, ready for the oven. You can fuss a little more with molding it into as nice a shape as possible, then transfer it to a rimmed baking sheet or pan lined with parchment paper. Press gently on the spleen to flatten it slightly and ensure that the filling has spread throughout the cavity. Preheat your oven to 400° F (200° C). Place the spleen in the oven and roast, uncovered, for about 45 minutes to 1 hour, or until the stuffed spleen no longer releases juices. Part way through roasting, if there are no fat renderings in the pan, you can poke the spleen with a skewer in to help release them. And, if you feel it’s necessary, a little bit of water can also be added to the pan just as would do for other types of roasts. The photos here show the stuffed spleen about halfway done, after it had begun to color. Some fat renderings are visible in the pan; they were released naturally due to the suet in the filling. The stuffed spleen will shrink a bit as it roasts to a lovely dark color. For even browning, you may need to rotate the pan. You can test if it’s done by pressing on it (it will have firmed up) and by poking it with a skewer to be sure that only a little clear juice, if any at all, is released. Remove the roast from the oven and allow it to cool a bit a before serving. Stuffed spleen is served in slices. If you’re not feeding a crowd, you’ll probably find that you have a generous quantity left over. The stuffed spleen can be wrapped in aluminum foil and reheated in the oven, or individual slices can be heated in a skillet or over charcoal in a grill basket. Here I have a section of the cooked stuffed spleen ready to wrap to take home with me. Once chilled, I sliced it before freezing. I then took single servings as desired for reheating. The fully cooked stuffed spleen will keep several days in the fridge or for two months in the freezer. 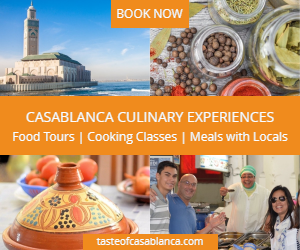 Christine Benlafquih is Founding Editor at Taste of Maroc and owner of Taste of Casablanca, a food tour and culinary activity business in Casablanca. A long time resident of Morocco, she's written extensively about Moroccan cuisine and culture. She was the Moroccan Food Expert for About.com (now The Spruce Eats) from 2008 to 2016.